Gulzar, Shreya Ghoshal, Shaan and Shantanu Moitra come together to pay tribute to Rabindranath Tagore by taking it to the masses. 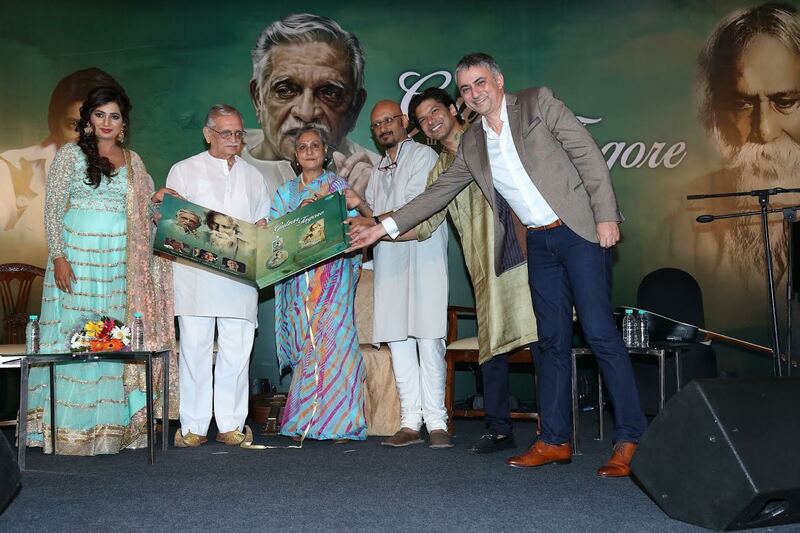 Mumbai, 18th October, 2016: ‘Gulzar in conversation with Tagore’, a passion project led by Gulzar which has been 5 years in the making, was launched this evening by Saregama India, the country’s leading end-to-end entertainment service provider. The album also features Shantanu Moitra, Shreya Ghoshal and Shaan. Gulzar in conversation with Tagore consists of 7 songs which bring out a different side of Tagore, who is primarily known for Rabindra Sangeet. This album was created in an endeavour to take Tagore’s work out of Bengal and share it with the country. The music features a variety of live instruments like flute, tabla, veena, piano and more. Vikram Mehra, Managing director of Saregama India Ltd says “This beautiful journey wouldn’t have been possible without the vision and passion of Gulzar Sahab. It’s an honour for us to be a part of this masterpiece created by him, Shantanu, Shreya and Shaan”. “Although I can proudly say that I have recorded over 40 Tagore songs, I must admit, I discovered the magic of his poetries and music rather late in my life. But in my formative years, the magic of Gulzar ji’s lyrics and films made an everlasting impression on me. To be a part of this ‘once-in-a-lifetime’ project where two of my all-time favourite icons come together, I feel incredibly lucky! I started my career with non-Bollywood music and with this project, it has come full circle.” said the versatile singer, Shaan, sharing is experience on this album. The event was attended by Jaya Bachchan, Papon, Swanand Kirkire, Purbayan Chatterjee among others. The album will be available to download on www.saregama.com. Songs will also be available on Apple Music, Saavn, Wynk, Hungama Music, Eros and Gaana.